3D Live Snooker Game Review - Download and Play Free Version! 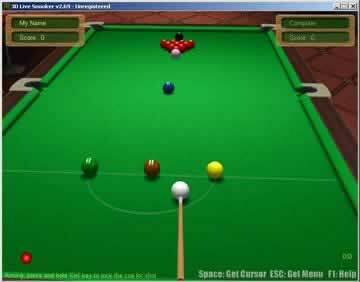 Extremely realistic Snooker for play on your PC! We're sorry but we are no longer able to offer this game. Snooker is one of the most popular billiards games in the world. Not only do you need skill shooting balls into pockets, you also need strategy. Snooker is played with 15 red balls (10 reds for Short Snooker rule) and 6 'colors' and a 'white' cueball. Each red is worth 1 point, yellow 2 points, green-3, brown-4, blue-5, pink-6 and black-7. While there are reds on the table, the ball you have to shoot at alternates between reds and colors, until there are no reds on the table. When only colors remain, the balls must be potted in ascending numerical value. When there are reds on the table, and a new striker approaches the table, the first ball to shoot at is always red. Fouls occur when you hit the wrong balls first and result in a 4 point increase in your opponents' socre. Higher foul points are awarded for color balls. Missing balls completely or pocketing the wrong balls also result in foul points. When all balls are pocketed, the player with the highest score wins. 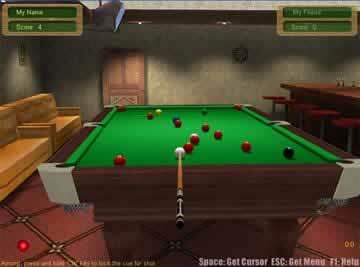 3D Live Snooker is a fun and realistic snooker game that will keep you entertained for hours on end. There are several different types of snooker to play ranging from mini-snooker to full snooker. You can adjust the appearance of various parts of the game, from the pool table to the balls you use. You can customize the difficulty of computer opponents to find something that fits your skill level. You can even check out your best scores and try to beat them. This is a great snooker game from start to finish. You start the game by selecting which type of snooker you want to play. There are ten different types of games to play, such as short snooker and full snooker. Once you select a game, you can choose other options. For example, you can name the computer opponent and adjust their difficulty, or play against another player instead. The variety of game types to select from adds a lot of variety and helps keep the game fresh, although the selection is a bit limited. There are two modes of play in 3D Live Snooker. Quick Play lets you take on a computer opponent or a friend in one of three different snooker games. You play the game you select continuously, while the wins and losses for each player are tracked by the game and shown on the screen. The other mode is Network Play, which gives you the option to take on a friend via a Network. However, you'll need their IP address to be able to play a game against them. When playing against a computer opponent, there are five different difficulty levels to choose from. These settings let you make the computer opponent harder or easier, depending on how skilled you are when it comes to pool. While the computer can still be challenging for those not as familiar or good at pool even on the easier settings, the game provides a good variety of challenge for all players. The controls in 3D Live Snooker are simple and easily referenced via the in-game help. These controls give you the basics of taking shots and adjusting the camera. However, they do not cover advanced shooting techniques or trick shots. A simple tutorial of some sort could have easily been used to teach the basics and some advanced techniques. At the same time, the controls don't present a huge barrier to playing the game to any player. The graphics in 3D Live Snooker are well done, and a bit better than other similar games. In addition, you have the option to customize the look of the pool tables, cues, balls, and even the rooms you play in. However, you have limited control over the camera angle and view while playing. You typically look from a side of the table, often making it difficulty to see the whole table or your shots. You can look from straight above, but you cannot move your cue or take shots in that view. The ability to play from either view would have been a good improvement. Additionally, the game is lacking when it comes to sounds. There are a few sounds for balls hitting each other and similar actions, but nothing beyond that. It makes the game feel quiet and a bit empty. Music and some more sounds could have made the game better. 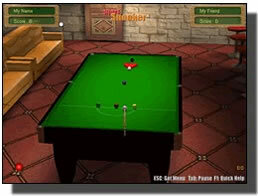 3D Live Snooker is an excellent snooker game with three different types of games to choose from. You can take on computer opponents at a variety of difficulty levels, or play against a friend on your computer or in Network Play. You have the ability to customize the appearance of pool tables, cues, balls, and rooms. A high score board tracks your best performances and gives you something to work towards. A few minor flaws pale in comparison to the positives this game has to offer. This is a game well worth playing for any fan of snooker.